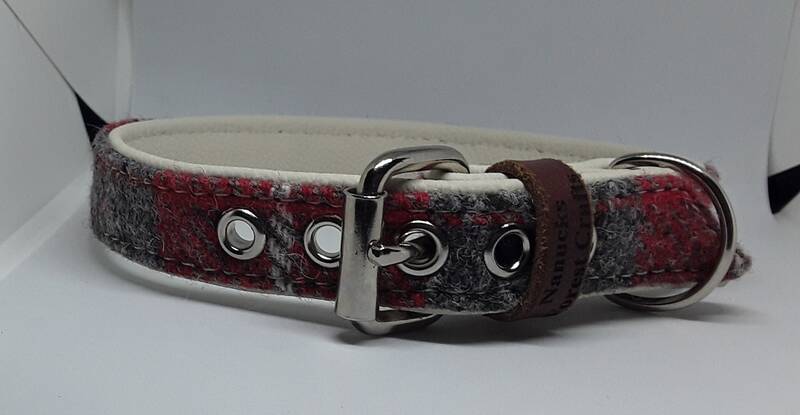 Genuine Red and Grey Harris Tweed on Cream leather dog collar with nickel plated stainless steel hardware. 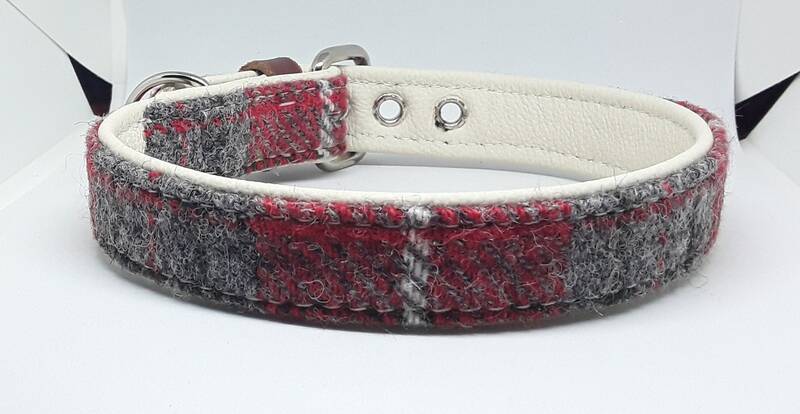 Here we have our hand crafted simple yet stylish quality Genuine Red and Grey Harris Tweed on Cream leather dog collar with nickel plated stainless steel hardware. Harris tweed label not included. All our products are hand made to order in our small workshop. We pride ourselves on making each item to a very high standard with the utmost care taken to ensure our customers are completely satisfied with their purchase. This collar is made from the finest real leather and comes with a nickel plated stainless steel buckle and welded D ring for your pets security and to enable the use of a dog lead. We also undertake a wide range of custom orders from dog collars and harnesses to wallets and a wide range of other leather items. If you wish to have a matching collar, leash and harness for your dog please just ask and we can get this done for you also. No enquiry too strange so feel free to contact us. Size guide we recommend adding 4" (10cm) to your dogs neck size for a comfortable and secure fit. For example a dog with a 16" (40.6cm) neck would require a 20" (50.8cm) collar to allow for any adjustment or growth. Please allow up to 5 working days for your items to be dispatched as they are all hand crafted. We also offer a money back guarantee if not completely satisfied.